The AS-30 is ideally suited for heavy duty applications. A wide range of packaged product, in virtually any mix are quickly and easily transported to their assigned divert stations. Product to be sorted is gently diverted by pushers designed with energy absorbing elastomer cushions for greater control and gentler handling. The pushers operate from inside the carrying tube extrusion, allowing for free, un-obstructed operation even when the carrying surface becomes contaminated. 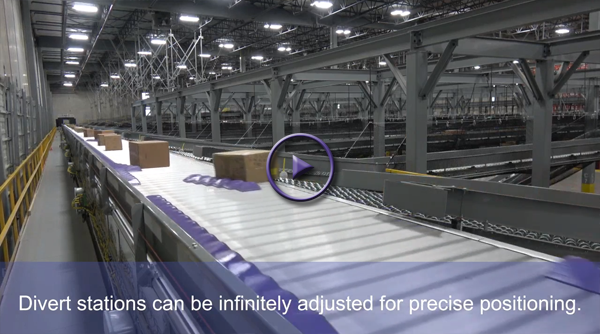 The AS-30 divert stations can be infinitely adjusted for precise positioning. Precision bearing wheels on all load components greatly reduce drive train load pull requirements and chain stretch.